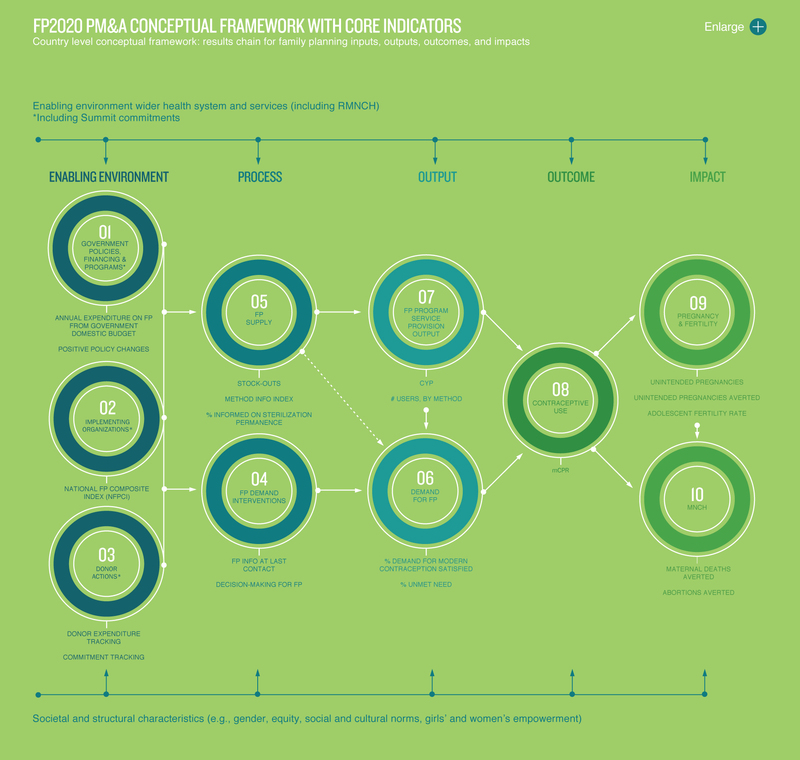 A set of 15 core indicators has been selected through a systematic process over the past 18 months to determine whether countries are on track to reach their goals, to assess strategies and inform decision making, to provide the tools to answer fundamental questions concerning the overall performance of FP2020, and, importantly, to measure how well individual needs are met. Ten will be reported annually for 69 countries. Data sources and methodology for the indicators will necessarily vary between countries that make a commitment to FP2020 and those that do not, although this distinction is ameliorated as new measurement grants are awarded that relate to FP2020 monitoring, such as the Track20 project. Many of these indicators will be modeled, since the data needed is not collected on an annual basis. Therefore, many of the indicators do not reflect direct measurement. 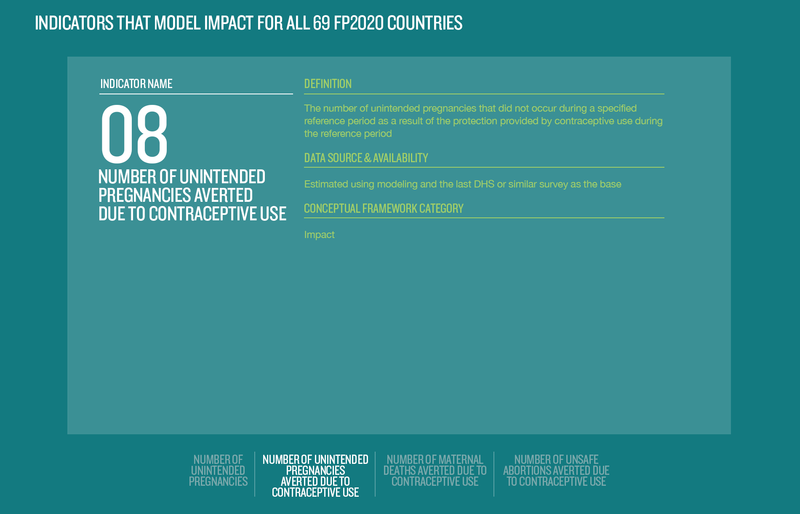 The process of developing FP2020 core indicators began in early 2012 with the creation of a Metrics Working Group that set out to estimate the overall parameters of the FP2020 initiative and establish a baseline for the number of contraceptive users in the 69 FP2020 priority countries. The Metrics Working Group also updated a conceptual framework (see chart on next page) from which indicators would be derived. The framework includes 10 conceptual domains, organized by the standard measurement sequence of enabling environment, process, output, outcome, and impact. Adjustments may be made to this framework upon further review by the Performance Monitoring & Accountability Working Group. 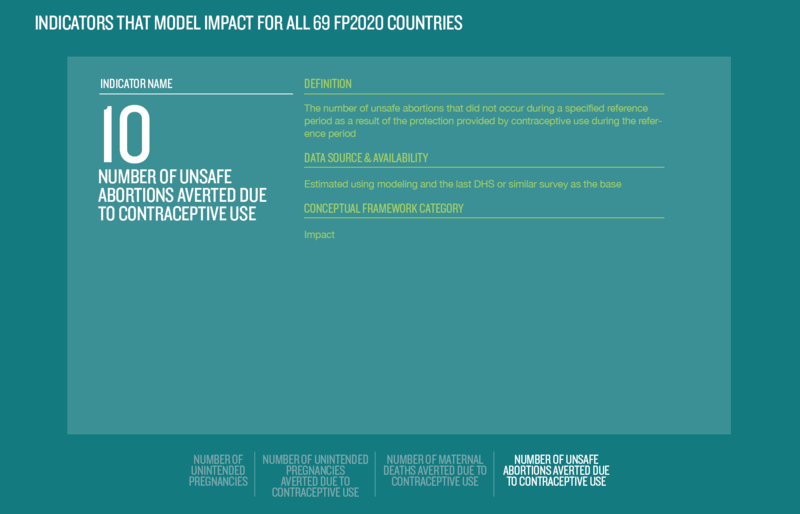 An important area of contribution of the FP2020 partnership is and will continue to be the identification of new indicators that better measure concepts of informed choice, autonomy, and the extent to which family planning programs are implemented in accordance with human rights principles. Currently, data that are routinely collected through existing mechanisms arguably do not adequately measure these concepts. 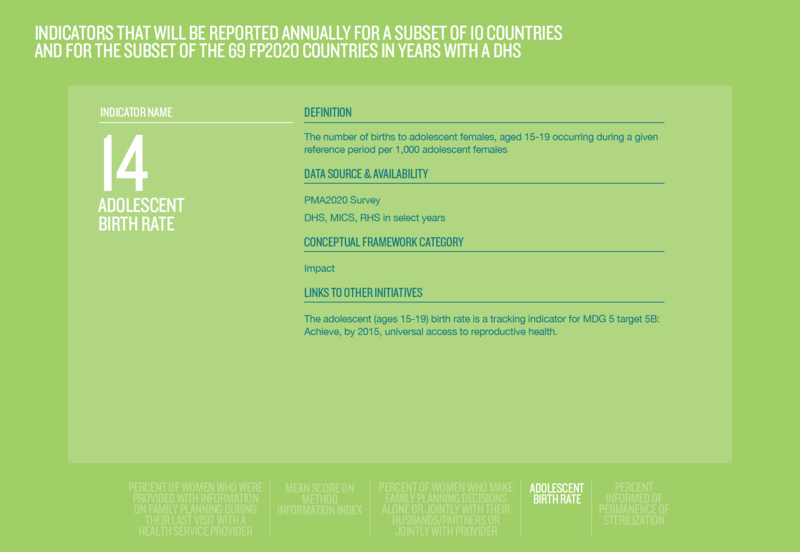 Both the Rights & Empowerment and Performance Monitoring & Accountability Working Groups have identified indicators that are not routinely collected in all countries through existing data collection mechanisms, and would require facility-level measures and/or do not have an existing data source that would allow comparison of such indicators on an annual basis among all 69 countries. 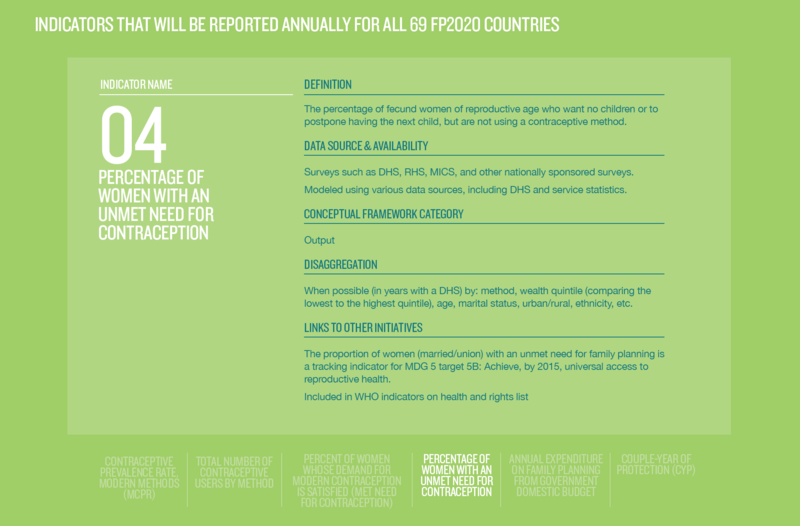 This work has benefited from collaboration with WHO, and FP2020 will align where possible with WHO’s upcoming guidance and recommendations on optimizing human rights in the provision of contraceptive information and services. 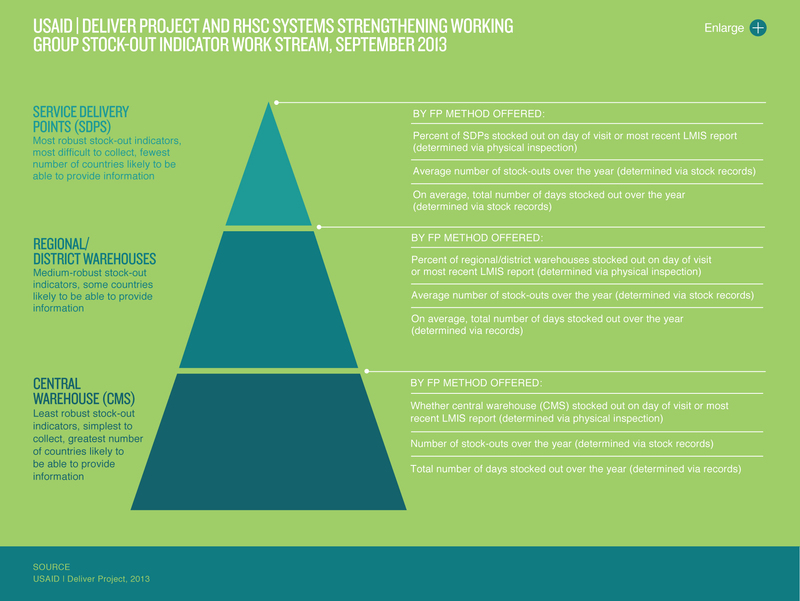 Read more on Indicators on page 68 of the full progress report. Download now. FP2020 plans to develop a National Family Planning Composite Index (NFPCI) as a comprehensive measurement tool to monitor the enabling environment in a manner that takes into account not merely the existence of policies and guidelines but also the extent to which family planning program implementation includes measurable dimensions of quality service provision. 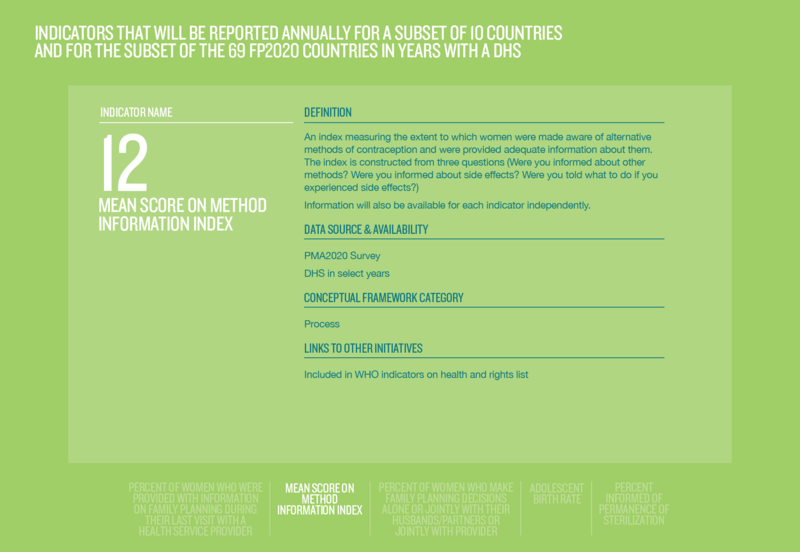 Future progress reports will contain index findings and country-specific information. 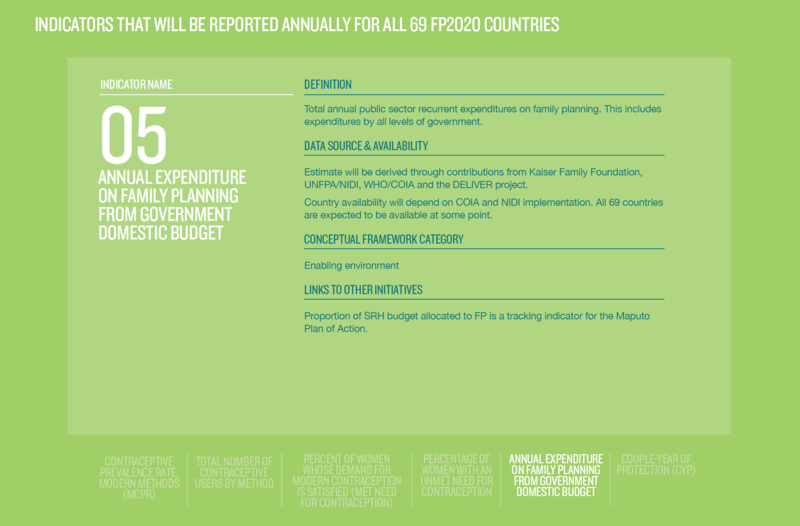 Read more on the National Family Planning Composity Index on page 68 of the full progress report. Download now. Track20 efforts will be concentrated mainly in countries that make a commitment to FP2020, though some technical support will be provided to all 69 FP2020 countries.